Belgium, Holland, Germany, Spain – no matter where the Vuelta a Espana goes, Columbia-HTC continue to rule supreme, with Andre Greipel taking the team’s third straight win and the overall lead on stage five. Greipel’s victory in Liege on Tuesday had been overshadowed by the major pile-up just a couple of kilometres before the finish. But this time round there were no such incidents to cast a pall over the German’s second win. Even though stage two winner Gerald Ciolek crashed in the final dash for the line, this time round Greipel still had to fend off sprinters of the calibre of Tom Boonen (Quick Step) and Daniele Bennati (Liquigas). Boonen briefly looked as if he would get it with an all-out charge for the line, but instead Greipel the green-clad winning machine dodged past him in the last 75 metres to take the stage by a bike length. 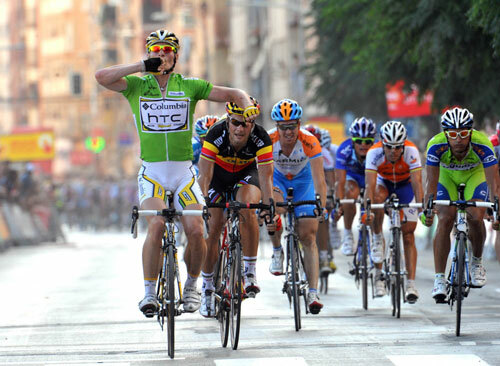 Columbia-HTC’s third successive victory in the Tour of Spain also earned Greipel the overall lead as well as the top spot in the points classification. But if Greipel’s win at Liege – through no fault of his own – had barely been more than a formality, in the race’s first stage back on Spanish soil, it was a very different story. Although stage five was fairly flat, a vicious little climb some six kilometres from the finish lined out the bunch and saw Belgian Classics star Philippe Gilbert (Silence-Lotto) make a gutsy lone bid for freedom. Taking some prodigious risks on the dangerous descent enabled Gilbert to stretch his lead to over 20 seconds with six kilometres. But behind an initially chaotic chase started to take shape and as the finish town of Vinaros loomed in the distance, Gilbert was reeled in. Only the technical run-in could have stopped a bunch sprint at that point, and Columbia-HTC combined with Quick Step to ensure their fastmen had a chance. Boonen was ideally placed, and Greipel had no final lead-out man, but it made no difference. The German sprinter is on top form and he had no problems seeing off Boonen and Bennati for Columbia-HTC’s umpteenth Grand Tour stage win of the season. Friday’s stage is hilly but not too technical, and Greipel should be able to hold the leader’s jersey at least until Saturday’s time trial stage in Valencia. After that, the Vuelta hits the mountains, and a very different race begins. 10. Francisco Jose Pacheco (Spa) Contentpolis-Ampo all same time.